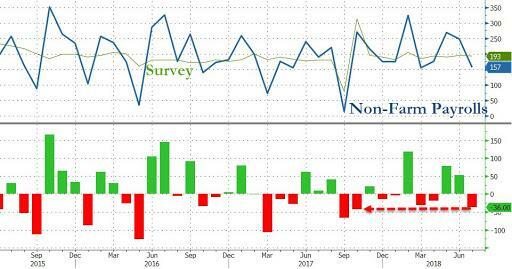 As per the earlier preview, there were virtually no potential downsides to today's jobs report (with a possible adverse exception of tariffs), and as so often happens, moments ago the BLS reported that July payrolls missed "bigly", rising just 157K, missing expectations of 193K, and the lowest monthly print since March. The 157K July jobs is well below the average monthly gain of 203,000 over the prior 12 months. This was the biggest miss to expectations since October. There is one potential culprit for the miss: the bankruptcy of Toys'R'Us: as SouthBay Research notes, jobs lost from the bankrupt retailer dragged payrolls lower by 31k. Offsetting the poor July print was the sharp upward revision to the June number which rose from 202K to 234K. The change in total nonfarm payroll employment for May was revised up from +244,000 to +268,000, and the change for June was revised up from +213,000 to +248,000. With these revisions, employment gains in May and June combined were 59,000 more than previously reported. 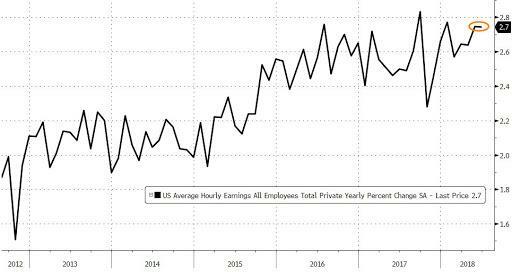 One reason why the market will likely ignore the poor print, however, is that average hourly earnings rose 0.3% in July, in line with expectations, while on an annual basis hourly earnings rose 2.7%, the same as June and also in line with the expected. 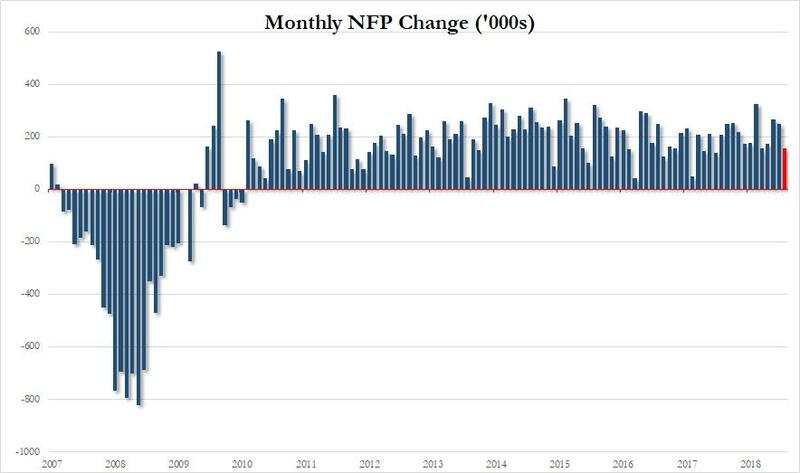 Another potentially troubling number is that the average workweek for all employees on private nonfarm payrolls decreased by 0.1 hour to 34.5 hours in July, following an increase of 0.1 hour in June. However, the average workweek for production and nonsupervisory employees on private nonfarm payrolls remained at 33.8 hours. 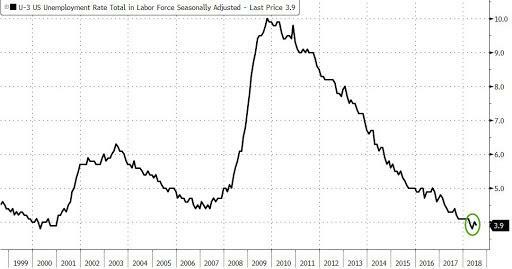 Bloomberg notes that while 12K employees said they could not work due to bad weather, the historical average for July is 31k employees; Meanwhile, another 104k workers who usually work full-time could only work part-time due to the weather last month.